The new Pop-Up OFFICEmodels can provide whatever amount of additional peripheral and storage space your workstyle requires. Printer/Storage cabinet interior can be configured to accept equipment of varying heights and styles. Options include interior task light, alternate door styles, and matching free-standing file cabinets. Cabinetry is finished on all four sides. Computer clutter spoiling your decor? YOU CAN MAKE IT GO AWAY! 29.5" tall, 49" wide, and 26 3/4" deep. To order, call Customer Service at 772-219-0455. 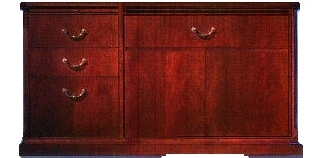 FINISHES: Genuine Wood veneers are Maple, Poplar or Oak, in your choice of finish stains. 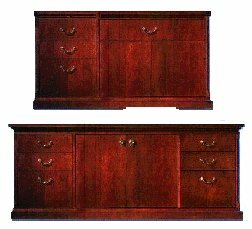 Genuine Mahogany and Cherry veneers and Hi-Tech designer finishes are also available as options. Freestanding matching 2-drawer letter size file cabinet $1450. The new Pop-Up OFFICE models share the same practical product engineering found in Summerland's award-winning, wired, lift-equipped, and handicapped accessible Learning Station models of The OFFICE. Click/Enlarge highlighted photos. HAVE YOU SEEN POP-UP TV?